Nothing is more motivating than progress. Taking baby steps forward can lead to amazing results: if you get 1% better every day you get thirty-eight times better in one year. My goal for creating this exercise was to identify which growth opportunity I should focus my attention on. I like to make progress visual. I decided to map out my day and identify areas where I can make the biggest improvements in the shortest amount of time. The areas I wrote down were: Sleep – Food – Exercise – Work – Passion Projects. Above every segment I drew how I thought my learning curve looked over the past couple of years. 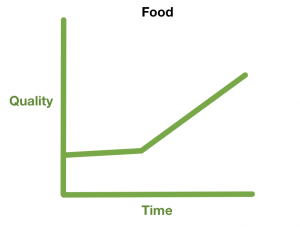 For example, food had a nice learning curve. I spent a lot of time reading and learning about a healthy food plan. My sleep learning curve is flat and that surprised me. I sleep approximately 1/3 of the day, but never paid attention to my sleep habits. 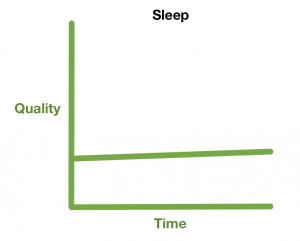 When I asked around most people never studied sleep either. We agreed on having a sleeping schedule, getting enough hours of sleep and not using electronics before bedtime – that’s about it. We learn a little bit here and there, but no serious progress is made. It is almost as if we don’t care about 1/3 of our life. This is an area were I can make progress quickly. I know very little about sleep so every article and book will give me new insights. A steep learning curve is very motivating; little wins fuel your motivation and that means it is easier to do the work. I found this a great exercise to identify opportunities for growth in my life. In less than five minutes I had identified an area to focus on and now the books are ordered and I am eager to study. I challenge you to try this exercise: you will be amazed how rewarding it can be! “The 7 habits of multi-millionaires”, many articles and books have titles such as these. Be careful however, before you start copying the habits and traits of millionaire’s consider the survivorship bias. The survivorship bias is the logical error of concentrating on the people or things that survived some process and inadvertently overlooking those that did not because of their lack of visibility. For example, the survivorship bias pulls us towards the billion-dollar founder. We look for the character traits that made them successful to copy and use in our own lives. We tend to overlook the people who had the same character traits but failed, they don’t make good stories. As a result, the difference between success and failure becomes invisible. A story from a college dropout earning millions might not motivate you to finish university. However, talking to all the college dropouts who struggle to make a living might change your perspective. They will tell what not to do: drop out. Because we only read about people who reached stardom against all odds we overestimate our own chances of building a billion-dollar company. We tend to forget that Mark Zuckerberg only represents a tiny part of a big population. In the book Fooled by Randomness, Nassim Taleb gives another example of the survivorship bias. A group of traders follows a strategy that is no better than random. As a result 50% will have a good year and 50% will have a bad year. Only 25% of the traders will have two good years in a row, and 3% will have made money every year for 5 years straight. It is important to realize that those who belong to the 3% did not achieve this because of their skill; it is purely due to chance. When we read about an investment fund that is profitable for 5 consecutive years we think they must be great. We forget that there are many more funds and that we only read about the successful ones. The reality is that their good results are completely random, pure luck. What makes a person or business a success? Did Facebook become a billion-dollar company because of their business model, Zuckerbergs’ habits or another reason? Since we can’t go back in time and start the company a 100 times over we cannot know what made the company so successful. This is the reason that we cannot take “The 7 habits of multi-millionaires” too seriously. Finally, in the book The Antidote: Happiness for People Who Can’t Stand Positive Thinking, Oilver Burkeman gives a great example why you can’t simply copy the habits of a successful person and expect an improvement in our own life. A study showed that extremely successful entrepreneurs share two traits: they are willing to persevere in the face of setbacks and they possess enough charisma to convince others to follow them. However, these same traits are also likely the characteristics of extremely unsuccessful people: to lose a lot of money requires both persistence and the charisma to let other people invest in your failure. The survivorship bias likely undermines “Tips From a Millionaire”, proceed with caution.